The term "sharbing" means to place one part of your matched betting stake in a betting shop - rather than using an online bookmaker. The word is a portmanteau of "shop" and "arbing". The process is exactly the same as when using online providers - you place a back bet with the bookmaker and they lay it with the exchange such as Betfair or Smarkets. Why would you want to place your bet in a bookies? There are a few advantages of placing your bet person - one of them being that there's a lot less chance of being gubbed - that is your ability to place a bet or claim a bonus will not be restricted. 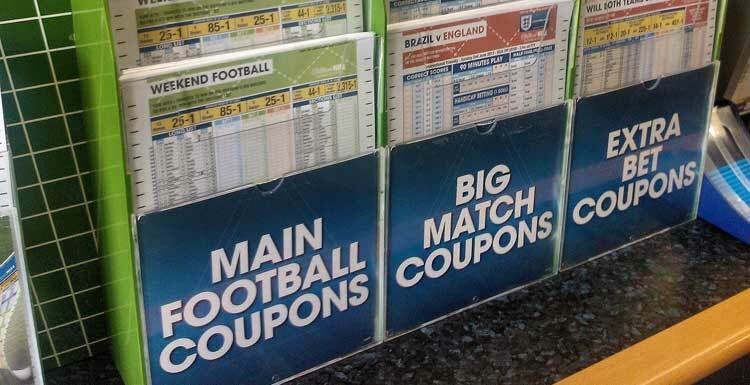 One big advantage of placing your bet in-store is the the potential for arbitrage using football coupons. Football coupons are printed at least the day before the match takes place, meaning the odds are often out of date. This can throw up big arbing chances - times when the bookmaker odds are more generous than the lay odds on the exchange. Be sure to place your bets using cash and vary the bookmakers you visit. For example, if you have three Ladbrokes branches near you, alternate between them. You will need to be able to check the lay odds, so having a phone with internet connection is vital. Don't, however, do this in the shop as this will arouse suspicion. You can take the coupon out of the shop to fill in if you prefer. Bookies do not have to honour the price on the coupon, so check with the assistant before handing money over. Many bookmakers now have touch-screen terminals to check the price of your bet, so you should do this before approaching the desk to place your bet. Don't get too greedy with your stakes. Increase your chances of going undetected by keeping your discipline. The odds on coupons will be fractional, so you will need to convert to decimal. You can use Profit Accumulator's matched betting calculator to check how much you should bet, lay and what your profit will be. As soon as you have placed your back bet, be sure to lay it on the exchange before any price shift. Plenty of bookies offer in-shop bonuses, just like they do online, that you can take advantage of - just like when matched betting online. Look out for free bets and enhanced odds. These offers are regularly posted on the Profit Accumulator forum. You can use any bookie for sharbing the opportunities will differ depending on where you go. Major operators such as William Hill, Coral and Ladbrokes are the best place to start as they have regular football coupons and offers. Note that all bookies will cut their odds from time to time - especially if there has been a shift in circumstances, for example a football team has a new manager. This is why it is vital to double check that the coupon price will be honoured before placing your bet. How much can be made from sharbing? Just like with online arbing, the profit percentages are fairly low. The amount you can make from each sharb will depend on how much you are allowed or able to stake and the difference between the back odds and the lay odds. Of course, bonuses such as free bets help top up your earnings significantly, which is why Profit Accumulator members share sharbing opportunities.